NR#1 1 star hotel in Veldhoven! Veldhoven is a perfect base. 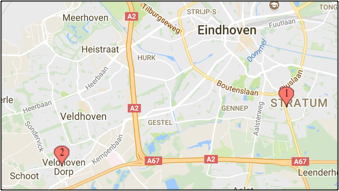 Whether you need to be private or business in Eindhoven. Because of its unique location you are at the central station, in the center of Eindhoven, on the High Tech campus, in the Maxima MC, at Philips or ASML. It goes without saying that we can easily be reached by public transport and there is free parking at the door. Due to its location, Lightotel is easily accessible via the A2 exit Maxima Medical Center. Looking for a hotel in Eindhoven?